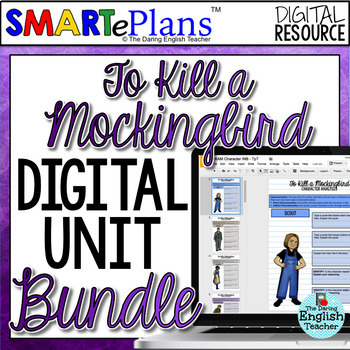 Teach Harper Lee's novel, "To Kill a Mockingbird," completely digitally with this digital Mockingbird teaching bundle! This digital bundle includes an introductory research activity, resources to teach character analysis and rhetorical analysis, chapter questions, multiple writing prompts, and a final essay. SMARTePlans are digital, Google-based, interactive lessons for the technology-driven classroom. 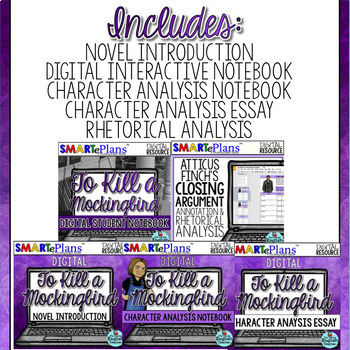 This digital interactive ePlan includes teacher instructions (GoogleDrive and Microsoft OneDrive) and a link to 20 slides of rhetorical analysis, annotating, and writing activities. This page includes 1 title page, 2 student resource pages, 4 pages of digital annotation that help break up the text for the students, 5 different analysis activities, 2 writing assignments, and a rubric. 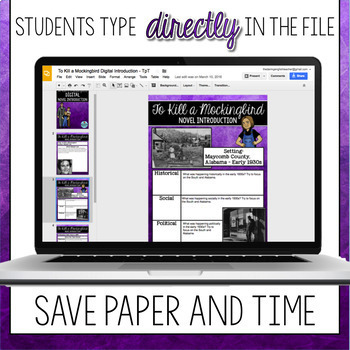 Your students will LOVE this digital resource, and you will see their writing improve.